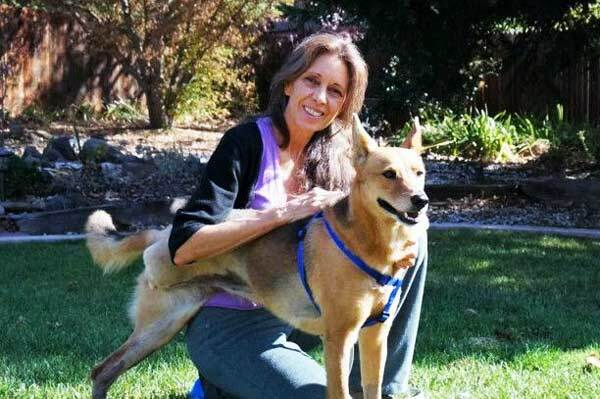 Tripawds Community member lovebug is recipient #34 of the Maggie Moo Fund for Tripawd Rehab. 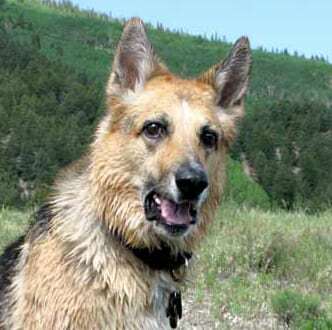 Read on for details about the benefits of canine rehabilitation for Tasha. Tasha is the name of my sweet 6 yr. old German Shepard mix that I rescued 4 years ago. In the early morning hours of Oct. 9th, 2017, there were several fire-storms that swept through Northern California. We live in Sonoma County where one of them forced us the evacuate our home with little in hand at 2 am. We went to my brother’s house in the next town and then had to evacuate there at 6 am the same day because the fires had been spreading fast. In all the smoke and turmoil Tasha managed to escape due to all the confusion and was hit by a car. She survived the accident, but had to have her right hind leg amputated. After the amputation healed–and the vet gave the OK to resume regular activates, they sent us home with little information on how to care for my now three-legged pup. Tasha had also previously suffered from an older injury to the left hind leg. This was concerning to me, because all the hind weight now had to be supported on that leg. I carefully searched the Internet and thankfully finally found Tripawds. The information here clued me in to the necessity of taking Tasha for a consultation with a Certified Rehabilitation Specialist. I chose VCA Animal Care Center of Sonoma County. There we met Dr. Kelly Hays, DVM, who had a Canine Rehabilitation Certification. She performed a gentle examination on Tasha and then recommended a routine specific to her needs: a series of stretches, exercises and a little massage that I would do with Tasha to help her to be more flexible and stay strong. Side Sit-Ups for Core Strengthening/Trunk ROM–range of motion. Place your dog on her side, lying down with involved side up towards the ceiling. Using a treat in front of your dog’s nose, lure dog’s upper body up as if doing a sit-up sideways. Hold for 10-20 seconds and return to floor. Repeat this 3-6 times, 5 times a week. Start with a few seconds and work up over time. Sit to Stand for Rear Leg Strength/ROM.Sit your dog with affected leg close to a wall. Using a treat or toy, lure your dog into a stand, slowly. Give treat/praise. Lure back to a sit. 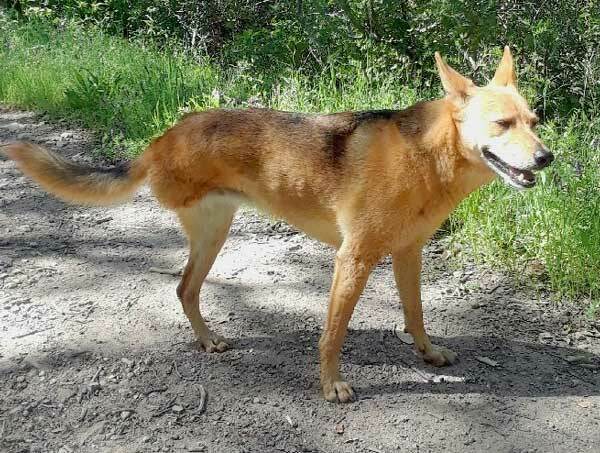 Make sure the dog is using affected limb to push to a stand. Repeat 4-8 times, 5 times a week. Biscuit to Hips for Weight Bearing. With your dog standing, move a treat from the dog’s nose to the left hip area. Make sure your dog shifts weight toward the involved side. Hold for 15 seconds. Repeat moving the dog’s nose to the right hip area. Repeat these 3-6 times a week, 4 times a week. Pick-Up Sticks. Proprioception, Leg Strengthening. Take several 5 foot long poles and drop them in a scattered design on the ground, slightly spread them out, but in a haphazard pattern. Walk your dog through the poles, placing treats in between the poles, while you walk on the periphery of the pile. Walk through the pile 3-6 times, 2-3 times a week. Dr. Hays also provided me with the names of two different joint support supplements to choose from for Tasha. Cosequin and Dasuquin, by Nutramax. She also recommended a quality fish oil for dogs as well to help with inflammation. My initial impression of Dr. Hays at VCA Animal Care Center of Sonoma was good, but I would have liked her to spend more time explaining exactly why and how some of these exercises would help. I also would have chosen a different Rehabilitation Center for the simple fact that it was the same place that Tasha had come for her emergency surgery and that caused her unnecessary stress to be back there again. My mistake. I’m so grateful to Tripawds for the giving me the opportunity to get Tasha that initial consultation that has helped to much. This experience has given me a better understanding of what it is to be a mom of a special needs pup and how beautiful and courageous our Tripawds family members are. I feel more confident that Tasha is getting more help to be the healthy, comfortable and confident pooch that she deserves to be. TASHA IS BEAUTIFUL, ABSOLUTELY BEAUTIFUL!!! My goodness, ypu and she have been through a lot!! So glad everybody is safe! Rja ks for shari6 tjese food exercises. A lot of these appear to be designed to build and strengthen th core …the tummy muscles which help to,provide support. Yeah, when surgery is done, they send you home with very little of what to do during recovery. This sitemis invaluable and chock full of first hand experiences! One thing taught here, if a dog sits down during a walk, his legs are already fatigued. So short walks several times a day are better than one loooong walk. Of course, long walks are certainly doavle, jist incorporate rest stops. Thanks so much for sharing these great rechniques and for sharing beautiful Sasha with us!